Looking to create an unforgettable event? This is what Frank's done for a living for more than 20 years. Have people talking about your event for years. 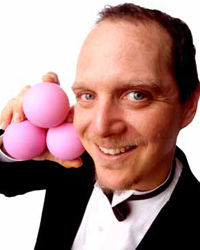 With headliner comedy and combined with death defying stunts, juggling, magic, unicycling and more. You may have seen Frank's comedy act on The Tonight Show, America's Got Talent, The Ellen Show, The Late Show, The Late Late Show, and about 100 other shows. He's starred in Las Vegas, played Lincoln Center, even done shows for presidents and royalty. All this to get him ready to entertain you, and your guests! The shows are interactive, and can literally involve your guests. 'Frank Olivier must be the best juggler in the world, he's certainly the funniest!' - SF Chronicle. Call today to secure your date, or for a no-pressure discussion of how to optimize entertainment at your event, whether or not you use Frank. Just give a call 510.525.0565.